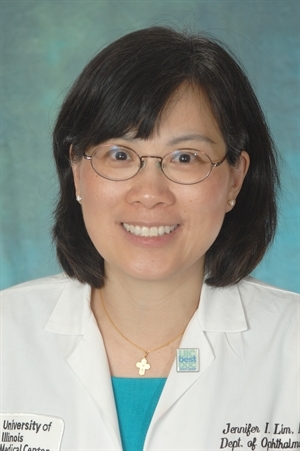 Dr. Lim is Professor of Ophthalmology and Director of the Retina Service at University of Illinois, Eye and Ear Infirmary in Chicago. She is the Marion H. Schenk Esq., Chair in Ophthalmology for Research in the Aging Eye. She received her Medical Degree with Distinction from Northwestern University Six–Years Honors Program in Medical Education where she was elected into Alpha Omega Alpha Honor Medical Society (AOA) and received the Dean’s AOA Student Research Award and the Julius Conn Memorial Award. She completed her ophthalmology training at the University of Illinois at Chicago, Eye and Ear Infirmary where she received the Resident research Award and the American College of Surgeons Resident Competition Chicago Chapter Keeshin Prize. She completed her medical retina and surgical retina training at the Wilmer Ophthalmological Institute of Johns Hopkins Hospital and was a Heed Fellow Awardee and a Heed Knapp Fellow Awardee.